My current food exploration involves tackling things that previously have been too intimidated to try: like pie crusts, and now, pickling. I love pickled anything, from a jar of Vlasic to the mixed-vegetable escabeche on the counters of taquerias. But could I, a city-dweller who only had access to produce at the grocery store and a limited collection of glass jars, pull off the mysterious feat of turning a regular vegetable into a pickled something? As always, the best thing to do is to turn to the experts. Chef Paul Virant is the owner of Vie restaurant in Western Springs, Illinois, as well as Vistro in Hinsdale, Illinois, and the owner of Jar Sessions, his own line of pickled and preserved products. Most of his canned and preserved ingredients are based on techniques he learned growing up on a farm in Missouri. His book The Preservation Kitchen: The Craft Of Making And Cooking With Pickles, Preserves, And Aigre-Doux, is full of helpful advice for both the novice and expert pickler, as well as recipes to pickle pretty much everything in the produce department. I was on board. But what’s the easiest way to pickle? He suggested a refrigerator-style pickling, also known as “quick pickling.” He threw out plenty of options, including giardiniera, and all of a sudden I got a flashback to my dad canning a bazillion banana peppers all over the house. Granted, I was too young to appreciate this effort at the time, but hot peppers are in my blood. So we settled on two pickle batches for my first time out: a mild carrot-dill combo and a spicier giardiniera. I decided to go with baby carrots, and then combine cauliflower, celery, and peppers for a traditional Chicago-style giardiniera. Once you have your vegetables and spices picked out, you can start pickling. In his book, Virant says that he often uses kosher salt instead of a particular pickling mix. But the salt is key to your entire pickling process, because your first step is to mix the salt into the vegetables, and you let that sit for about two hours, so the salt can remove some of the vegetables’ moisture and get them crispy. To figure out how much salt you need, Virant introduces the first equation of a significant amount of math involved here: take the weight of your vegetables and multiply that by 0.045 to find out how much salt you need. So, 100 grams of vegetables = 4.5 grams of salt. For my batch of giardiniera, for example, I mixed the vegetables with a 1/2 cup of salt and filled the bowl with water, covered it, and let it sit for a few hours. At the end of the salting process, rinse all the vegetables with cold water, then let them drain in the colander. While they’re draining, you can prepare your brine. Again, math came up: 57 percent of your total recipe is the vegetables, 4 percent is salt, and the rest (39 percent) is brine. The brine itself breaks down into a ratio of vinegar, water, sugar or honey, and salt, basically “two parts vinegar, one part water, seasoned with salt and sugar to taste.” You can keep doing math, multiplying the weight of your vegetables by 0.033 to get the proper amount of vinegar. Combine in saucepan and heat until boiling. Move your prepped vegetables from the colander into a canning jar or a similar appropriate container, and add spices. Pour the brine in, and let the jar cool to room temperature. Then put the lid on and put it in the fridge all day or overnight. For spices, Virant relies on whole leaves and whole seeds. He also toasts them beforehand to bring up their flavor. I added some garlic and oregano to give my giardiniera a bit of an Italian spin, along with red pepper flakes for heat, while whole dill and fennel seeds added some interest to the carrots. Virant advises home picklers to come up with their own herb and spice combinations, and to add oomph to vegetables by grilling the onions, say, or charring the peppers. You want to make sure you’re giving your vegetables enough time to pickle—denser options like carrots can be blanched first. But this quick pickling method is so simple that “you could do it in the morning, and enjoy it that evening, mix it with some olive oil and eat with some grilled fish or steak,” says Virant. 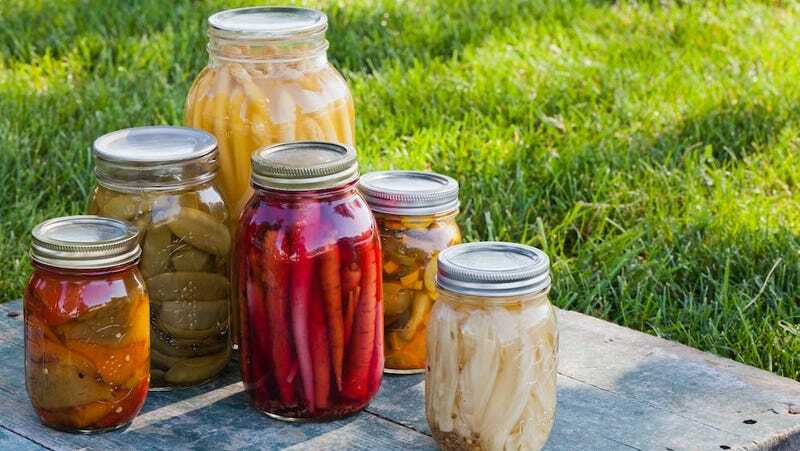 The pasteurization process that daunted me, Virant explains, comes from old farm cooking methods: “They would pasteurize jars out of necessity because they didn’t have refrigeration.” Since your pickles are refrigerated, you don’t have to worry as much about their staying power. He has a tip, though: Be sure to pull the pickles out with a clean fork, otherwise the bacteria from your hand gets in there and contaminates all the other pickles. On an otherwise busy weekend day, I somehow still found time to make my two batches of pickles. For the giardiniera, I used Virant’s basic brine above, along with the spices I mentioned, mixing in a bit of olive oil at the end. For the carrots, I used the recipe below straight from Virant’s book. Both of these involved minimal prep work, and mostly required refrigeration time. I let both batches set overnight. In the morning, I was excited to wake up and discover that I had actually pickled something. I made my husband eat pickles for breakfast: “Does that taste like a carrot? Or a pickle?” I asked. He responded, “It tastes like a pickled carrot.” Success! And, a mighty delicious one, I might add. The giardiniera was excellent as well, with a nice kick of heat from the jalapeños. Now I’m even looking forward to farmers’ market season even more, to try out various delicious vegetable/spice pickling combos. I’m going to need to buy many more jars. In a pot, bring the water, vinegar sugar, and salt to a boil. In a dry sauté pan over medium heat, toast the coriander and fennel seeds, black peppercorns, and red pepper flakes. Scald six pint jars in a large pot of simmering water. Right before filling, put the jars on the counter. Divide the spices among the jars, using about one teaspoon a jar. Soak the lids in a pan of hot water to loosen the rubber seal. Meanwhile, in a pot of boiling, salted water, blanch the carrots for 2 minutes. Drain and pack into the jars. Fill jars evenly with brine (this is when I added the dill). Then seal. Let the temperature of the jar come down to room temperature before refrigerating the pickles overnight.